So, I am apparently the most awesome Puppy ever, having three award recommendations in the Hugos, Sad Puppies Bite Back being the #1 Best Related work. Aaaannnnnddddd that was me, gloating. I'm done now. First of all, I am on the recommendation list in three categories. I will happily accept the recommendations, because I'll take all the help I can get. 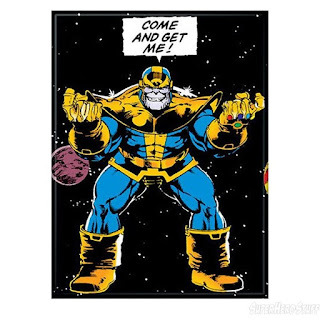 Though before we get too happy, let's go over what this means. The Sad Puppies: Save the Children Campaign 4 list is a recommendation list. 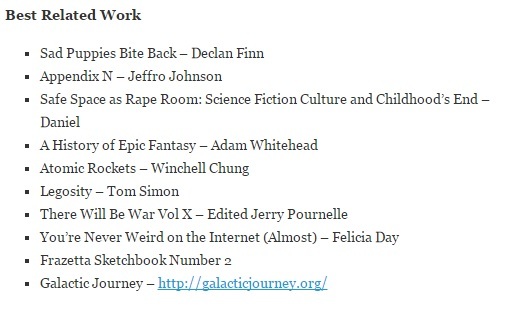 They give ten suggested works to fit into five Hugo nominations. From here, there are two weeks for people to read as much as they can, of as many things as they can, and cast votes for what they prefer. Remember, the deadline for voting for in the Hugo nominations is March 31st. And while I'm #2 on two lists, let's take a look for a second. Notice, while there is a list, there are no numbers. So, while I imagine that anyone going down this list would go top to bottom, there's no guarantee that anyone will get through Somewhither before March 31st, to heck with Honor At Stake. So nominating me for a Hugo? Heh. Now, on the other hand, going through the list of ten novels,you can delete three right now: Ringo and Correia don't want it, and Leckie is ... not necessarily among the most loved by Puppies the world over. So, were I Madam Leckie, I wouldn't hold my breath. She might even reject the nomination, because evviiiillll Sad Puppies are "conservative." I guess comparatively. So, it's only me versus five of some of the best known, most loved, and bestselling authors on the planet Earth: John C. Wright, whose work is comparable to that best of science fiction has to offer. Michael Z Williamson, who has legions of fans on Facebook. Neal Stephenson, who is the Tom Clancy of SF&F. Naomi Novik, who created Horatio Hornblower with Dragons. 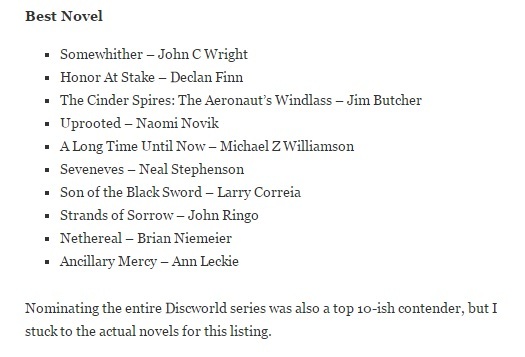 And Jim Butcher, who's been on the bestseller list for about the past decade. The only reason I'm not terribly worried about Brian Niemeier is that he wants to be nominated for a different award for best first novel ... or new writer. Or something like that. And he has to go up against The Martian, so, yeah, he's also got some competition. To be perfectly honest? At the end of the day, if this is as far as I go, I'd be happy with just the Sad Puppies nomination, and run with it. Because, frankly, I didn't think I'd get this far. I had initially made certain to vote for Honor At Stake because I didn't want to be the schmuck who didn't vote for his own lousy book. Though I would be amused to see if Honor At Stake gets a nomination. That way, I can go to the Catholic Writer's Guild, and see if I can get on their Seal of Approval list. A CWG novel nominated for a Hugo. And, of course, if that happens? Well, they hate John C. Wright for being publicly and loudly Catholic. Imagine "Catholic Writer's Guild Seal of Approval on Hugo Nominated work for best novel." Yes, I'll be happy with the Sad Puppy nomination, but a Hugo nomination is going to be heavy in entertainment value. Yes, Sad Puppies Bite Back is number 2 in that list. And I'm surprised to some degree -- that I'm so high on the list. 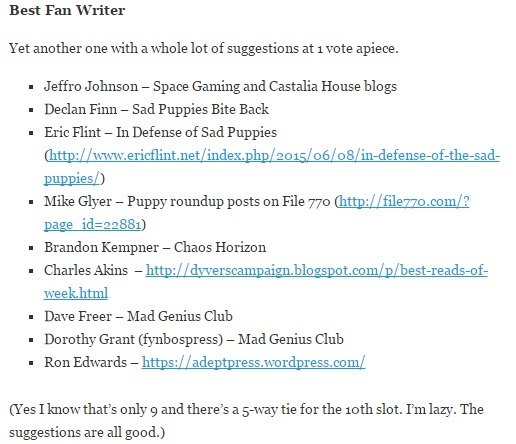 Then again, Mike Glyer is generally not considered a fan of the Puppies, and he made it on the list, so anything goes, apparently. Glyer is generally considered personally neutral, while his comments section is filled with raid wildebeests, but who knows? He accepted a nomination from Vox Day's Rabid Puppies. he'll probably take this recommendation too. The SPBB collection is my most commented on series of posts, as well as some of my highest-rated posts of all time. Not bad for a guy who basically wrote down a fever dream that wouldn't let him alone. My major competition (I'd guess) would be bestselling author Eric Flint, the pleasant and friendly Dave Freer, and the awesome Dorothy Grant. Why do I think only those three are a threat, and not the other five? Again, because Glyer has mixed reviews among the Puppies. And because I'm ignorant of who the other four are, and I don't think I have the time to read a good sampling. Kate Paulk isn't the only one who's "lazy." On the one hand: "I'm up against Felicia Day?" On the other: "SPBB is #1! Wow. Who knew?" I'm seriously blown away by the people who have really, seriously believed in SPBB, and in Honor At Stake. SPBB was a fever dream that spun out of control, and Honor At Stake started as "Oh, my acquisitions editor acquaintance wants a book, here, I'm not doing anything with this one. It's just a vampire novel." And that turns into my best-reviewed book. I'm still kind of thrown. How did I get here? Where am I going? And why am I in this handbasket? And, according to people who pay attention to such things, the Puppy Kicker crowd really, really hate me for, well, making fun of them. Because I take them as seriously as they deserve. So, this will be fun. It's time to UNLEASH THE PUPPIES OF WAR. "At the end of the day, if this is as far as I go, I'd be happy with just the Sad Puppies nomination..."
Agreed. 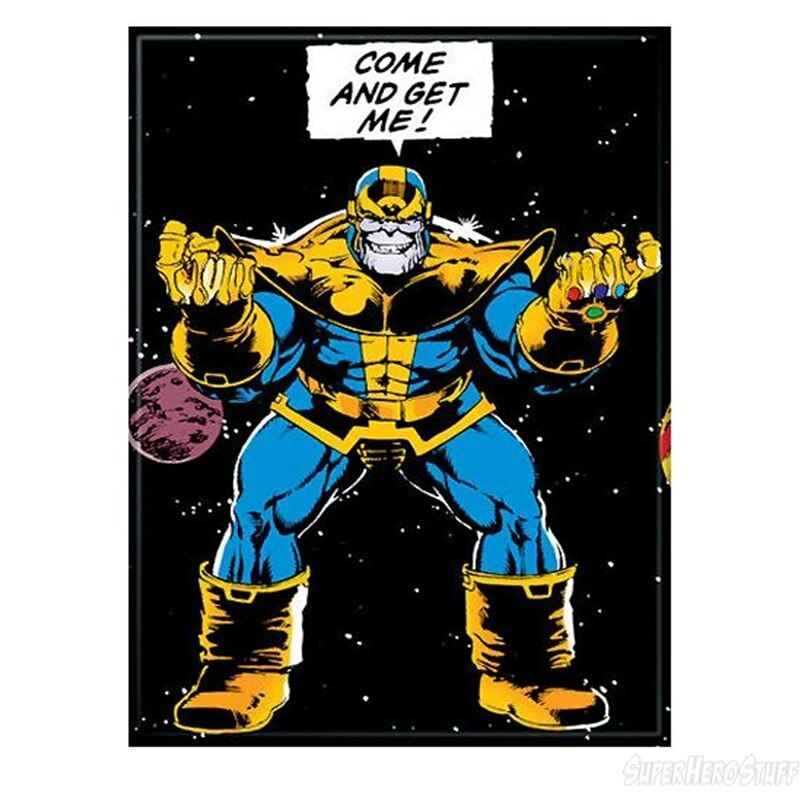 I've talked to readers who are more excited about me making the SP4 list than they are about the prospect of a Hugo nomination. In fact, one fan said that he'd have to return Nethereal if it won a Hugo. Perhaps that says something about SP's credibility vs. the CHORFs'. Then again, that's the problem we're aiming to fix. Where is this list? The link you provided goes to their page where they tell you to go check facebook. I hate facebook. Why did they even bother making a website if they're just going to tell people to go to facebook? "The Sad Puppies: Save the Children Campaign 4 list is a recommendation list." Clicked on it - found no list - what am I doing wrong? No idea. It should link to the sadpuppies4.org page. It does when I click.... huh. This is SO exciting! Bravo! #SadPuppies ask -- who's rabid?